The farewel to Vaux Hall is a song by John Frederick Lampe (c1703-1751), a musician and composer who like Handel was born in Germany and came to London to further his career. This he did quite neatly by marrying Isabella Lampe (née Young) thus becoming Thomas Arne’s brother-in-law (Arne had married Isabella’s sister Cecilia in 1737). He was employed as a bassoon player in Handel’s orchestra. Like Arne, Lampe’s compositions would have endeared him to many of the Vauxhall clientele as he was quite forthcoming in his denunciation of Italian opera, going so far as to produce a mock opera, Pyramus and Thisbe, parodying the genre and stating the case for the superiority of English music. 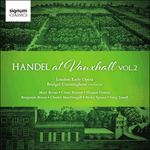 In 1745, following the appointment of Thomas Arne as principal composer at Vauxhall, the music of the gardens became a significant force in the development of English musical taste. Arne and his wife, the singer Mrs Cecila Arne (née Young), his family and pupils, including the Lampe and Young families, were to dominate the music making at Vauxhall for many years after he brought a new structure to the concert programmes. This song is from British Melody or the Musical Magazine and the headpiece above the music features musicians going home after the final evening of the season, carrying their instruments—a viol, violin, a trumpet, a French horn and flute. The Farewel is a gentler work, reflecting the musicians’ regret that another Vauxhall season is over. Given the relatively low rates of pay for professional players, the steady income they received from the gardens during its summer opening would no doubt have been a cause for regret when the season came to an end and this valued source of income ceased. An annotation in ink and pencil at the base of the page reads ‘Likeness of Mr Tyers … from the original drawing by Hayman in the possession of Mr Barrett’ which suggests that Jonathan Tyers is depicted as one of the main figures in the drawing. Attend ye inraptur’d list’ning Throng. That witness’d to a thousand Loves. The Bosoms of the lovely Fair. With haste restore the blooming May. To scenes of Harmony and Love.